We have all heard about the amazing growth of Facebook video. Only a month after they started autoplaying videos, Facebook video grew by 50%. And last month, Facebook video outgrew YouTube in terms of what type of videos brands are posting on their Facebook pages. This all sounds pretty fantastic, but it's a very manipulated form of growth. First of all, that 50% increase in traffic wasn't really because people were watching more video. Most of it came from how Facebook is measuring it. On YouTube, a video view is measured as a real view. As in a single person choosing to watch the video. It's a deliberate and validated action. On Facebook, a video view is counted if a video is in view for an auto-playing 3 seconds or longer. You don't have to be much of an analyst to realize that those two are not even remotely comparable. YouTube is measuring real people choosing to do real things, while Facebook's video measurements are as a bad as with banner ads. Facebook is also deliberately skewing the exposure of Facebook video. To illustrate how, let me show you the result of a little test I did last month. If you are following me over at Twitter, you will know that I have been ranting about how my Facebook Newsfeed suddenly appeared to be all about video. Every single day, I always see video, video, video... and them some other things. So, I decided to test if Facebook were deliberately adding video posts to my feed in order to boost their own stats? And, if so, if it is done in a way to skew real organic popularity? Remember, Facebook's Newsfeed is ranked, as they say, to always highlight the best and most relevant content. But is that true, or are they merely manipulating the stream to further their own goal? As you can see, the top of my stream is filled with video posts. 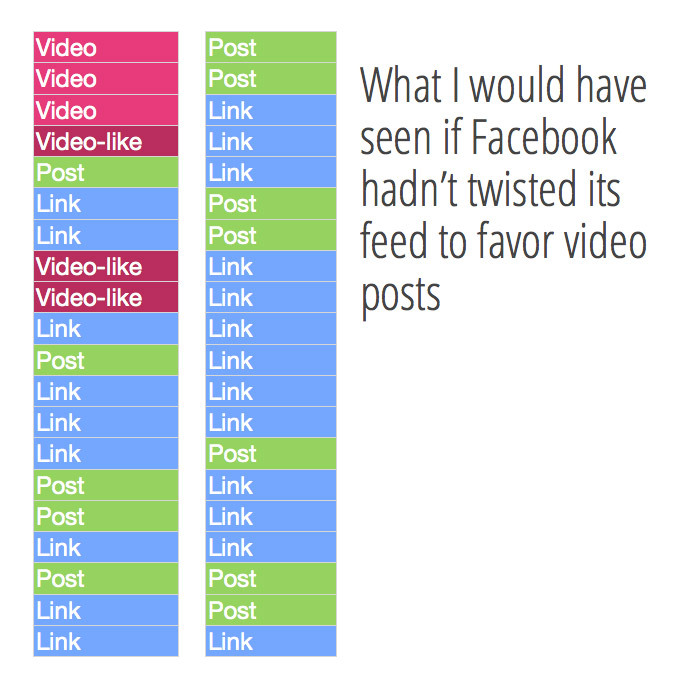 Facebook has even added video posts that weren't shared, but merely liked by another person. The next thing I did was to look at the newsfeed as if it wasn't ranked at all, for the same period of time. And the result was noticeably different. Obviously, this was just a very simple and unscientific test, but it matches what I have observed over the past couple of months. Every time I go Facebook, it seems like the top of the feed is always dominated by video posts. In other words, Facebook video is not as popular as Facebook makes it appear. Instead, it looks like Facebook has twisted the newsfeed so that 30% of your organic newsfeed is being replaced by Facebook video posts. Of course, Facebook will say that they are doing this to improve the feed to make it more relevant and interesting, but this is also the source of my biggest grief about Facebook. If I compare the filtered feed created by Facebook's algorithms (and favoring video posts) to the unfiltered feed of organically published posts, the unfiltered feed is far better. Sure, there are posts that I just don't have much use of (like pictures of a newborn baby by a person I used to work with 8 years ago), but I can easily solve that by simply unfollowing that person. But, compared to Facebook's standard newsfeed, which now seems to be filled with crappy viral videos, the unfiltered view is far better overall. I would prefer an unfiltered feed any day. I wrote why this is in "How Social Media is Making itself Irrelevant". These algorithms don't actually solve the problem they are designed to solve. Instead, they promote a sub-type of content that is neither good nor really bad. And when they then mix this with video posts that doesn't seem to have earned their place, we end up with a newsfeed that just isn't very good. It's 'virally' interesting. But it isn't good. Obviously, if you were to ask me about tactics, my suggestion to you would be to posts Facebook video instead of links to YouTube. Since Facebook seems to be favoring that type of posts, it would be foolish for a brand not to take advantage of that. As a brand, your role is to generate the highest level of ROI possible. Also keep in mind that this is the umpteen newsfeed change committed by Facebook. Only a few months ago the advice was to focus more on video as links. It's hard to define a Facebook strategy, because Facebook is constantly tweaking what tactics work based on whatever they are focusing on at the moment. And unlike SEO where you can always fall back on quality content as your overall strategy, you can't do that on Facebook. My best advice to you, however, is the same as always. Focus on creating products and experiences that encourages your audience to share those things on their own. That is a far more effective strategy than anything you might share on your own Facebook pages. And, it's a strategy that has a long term impact, rather than just being a temporary optimization for the moment. Video is tricky because of how Facebook is twisting the views. But, overall, YouTube is a far more long-term platform for building a video audience than Facebook. On Facebook, your video is only viewed for the short moment it is promoted in the feed and shared by people. After that it disappears from view and is somewhat forgotten. On YouTube, we have far more long term viewing patterns, in which people explore playlists and search for specific videos about things they are interested in, not to mention the impact of YouTube SEO. It is common for a YouTube publisher to have 60-70% of their views happen over time (as opposed to the initial attention). 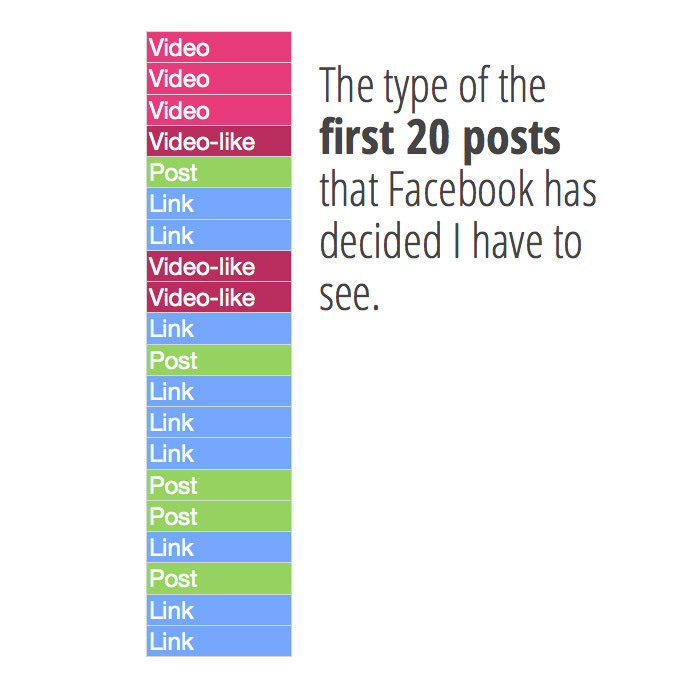 On Facebook, you have almost zero views over time, unless your posts are reshared and goes viral (which happens very rarely on a per video basis).